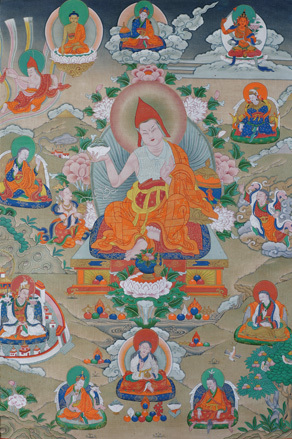 Guru Padmasambhava (Skt. ; Tib. གུ་རུ་པདྨ་འབྱུང་གནས་, Wyl. gu ru pad+ma 'byung gnas, Eng. ‘Lotus-born’) is actually the specific name of one of the Eight Manifestations of Guru Rinpoche. However, the name Padmasambhava now commonly refers to all the iconographical aspects of Guru Rinpoche. As one of the Eight Manifestations, Guru Padmasambhava is most often depicted as a pandita wearing monks robes, holding a kapala in his right hand and performing the vitarka mudra with his left hand. Phillippe Cornu, Dictionnaire Encyclopédique du Bouddhisme, page 419. Chögyam Trungpa, Crazy Wisdom, The Collected Works of Chögyam Trungpa, Volume Five (Boston & London: Shambhala, 2004), page 123. Chögyam Trungpa, Crazy Wisdom, The Collected Works of Chögyam Trungpa, Volume Five (Boston & London: Shambhala, 2004), pages 123-133. This page was last edited on 21 July 2017, at 03:56.